Augmentation of a receded chin may be performed in multiple ways. For patients with misalignment of the upper and lower jaw leading to a bite abnormality (known as malocclusion), orthognathic surgery is preferred to address the malocclusion and chin recession at the same time. For patients with normal occlusion and a receded or weak chin, Dr Harirchian performs a mentoplasty. Mentoplasty, or chin implant surgery, is a surgical face & neck procedure used to correct a receding chin. This will harmonize facial features and create better bone structure. In men, a stronger jawline may be more desirable, while in women a softer look is generally preferred. Dr Harirchian performs a mentoplasty with a biocompatible synthetic chin implant which looks and feels like your own tissue. Chin augmentation with a chin implant may be performed as the sole surgical procedure. Often, it is combined with other surgical procedures to optimize facial harmony. A receded chin will often make a large nose appear larger and vice versa. Therefore, mentoplasty is often performed in combination with a rhinoplasty. Chin implant surgery is also performed with neck liposuction in patients with a bulge under the chin and a weak chin. A facelift is also combined with a chin implant in patients who are facelift candidates and have a receded chin. Before surgery, this patient was concerned about his jowls and looseness of the neck. He also had a receded chin. 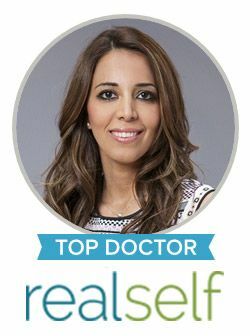 Dr Harirchian performed a chin implant surgery and a facelift for the best neck recontouring and elimination of jowls. Contact our office today to schedule a consultation with Dr. Harirchian to see if you may be a candidate for chin implants.